You are checking out this review because you like adventure bikes, that’s why you read UpShift Online. This 2017 Honda VFR1200X falls into Honda’s adventure line of motorcycles, which includes the XR650L and the Africa Twin. 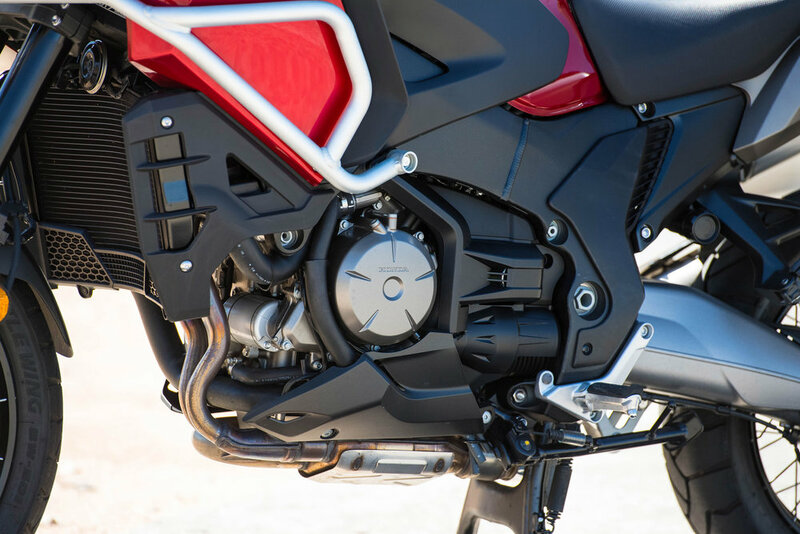 Honda even considers the 500X and the 700X part of their adventure line. Die-hard adventure riders are rolling their eyes right now knowing that anyone would call this VFR1200X an adventure bike and we get it, it’s not an Africa Twin or a KTM 1190 or even a BMW GS, but it will handle a bit of dirt. We know this because we rode it in the dirt, and by some riders’ standards and definition, a dirt road is a riding adventure. 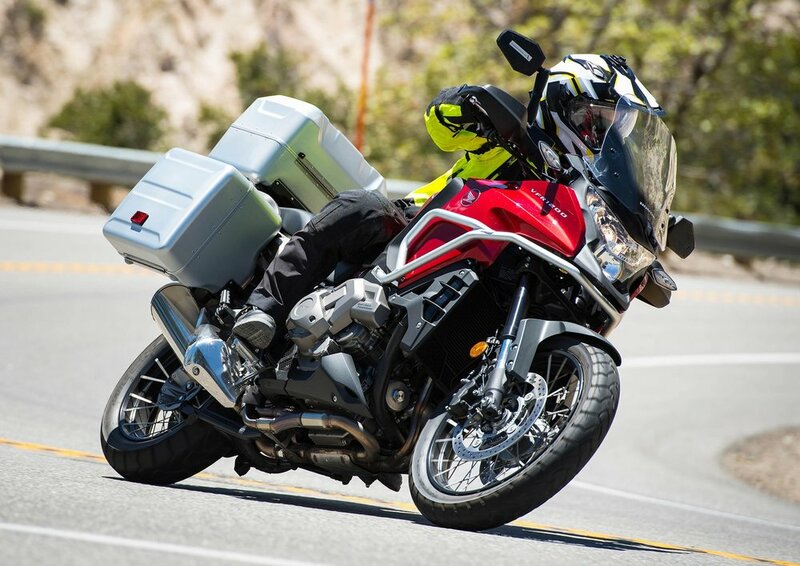 The reality is simple: the VFR1200X is an adventure-touring machine. It has the looks and the style of its true adventure sibling, the Africa Twin, sporting crash bars, handguards and having a similar stance, but its heart beats to the touring world. The 2017 VFR1200X is just like the 2016 model, except it now comes in red instead of black. It is powered by a 1237cc, 76-degree Unicam V4 engine and is available with a six-speed manual transmission or how we tested it, with the DCT (automatic) transmission. The DCT is incredibly easy to use, simply click it into D (drive) mode and twist the throttle. There isn’t a clutch lever or a normal foot shift lever. It is just like driving your automatic car. In normal D mode the automatic transmission upshifts quickly at low rpms. This is fine for mellow riding, good gas mileage and ultra smooth transitions between gears. Switching over to S mode and choosing one of the three options increases the shift points, keeping the engine higher in the rpms. S3 is the most aggressive S mode and most of the time when out on the more open and twisty roads, I chose S3 or S2. When the roads became super twisty I switched over to manual mode (super easy with a push of a button on the right hand side of the handlebars) and used the push button shifters on the left grip area to keep the bike locked in the gear I wanted throughout the corners. If you enjoy riding in the dirt more than logging miles on the asphalt, this probably isn’t the bike for you. The Honda VFR1200X will gladly navigate mellow dirt roads, especially with a more aggressive tire, just avoid rocks that could connect with the bottom of the engine and exhaust, especially if the suspension compresses heavily at the wrong time. The VFR uses a linked ABS braking system that works great; it’s smooth and predictable, but unfortunately the ABS at the rear wheel can’t be turned off, which makes aggressive riding in the dirt much more difficult on a bike of this size and weight. When it comes to traction control, there are three modes of varying degree or you can turn off the traction control completely. We played with all the different settings in the dirt and preferred setting one. Of the three settings it allowed the most rear wheel spin (still not much) and kept the VFR from getting too loose and sideways. With the traction control completely off, the combination of slick tires and a powerful engine made for some scary moments. Even the slightest twist of the throttle had the rear wheels spinning wildly. Again, if you take your time and choose fairly maintained dirt roads, the VFR1200X is a perfectly capable adventure-touring bike. The VFR engine provides heaps of torque and power off idle and through mid range. It isn’t a high-strung revving engine, with redline only at 9000 rpm, but it doesn’t need to be. The strong low-end power is predictable and response is precise while still providing smooth acceleration. Going from on/off throttle didn’t cause any jerkiness and made riding in traffic and through city streets a pleasant experience. If you want a quick burst of power, simply crank the throttle and let the DCT downshift quickly or hit the downshift paddle yourself with a quick stab of the left thumb. If you forget to upshift don’t worry, the computer will go back to working the automatic transmission. You don’t have to switch out of auto mode to make manual shift changes. When in manual mode you will have to make all the shifts yourself. If you forget and come to a stop, it will downshift for you. The DCT system is downright impressive. I’m only 5’8” and the VFR felt very roomy. The low 33-inch seat height allowed me to touch the ground fairly easily, so riders taller than me will feel right at home aboard the VFR. Overall the VFR is all about comfort, including the seat. The windscreen does a great job of providing protection at speed and the adjustment lever is easy to use with one hand, even while buzzing down the road. One major thing that leaves the VFR confused as to what category it is supposed to live in is the lack of cruise control. Sure you can add it on via an aftermarket product, but any good touring bike should come standard with cruise control. The VFR still uses traditional throttle cables, making cruise control more complicated to install. A ride by wire system would make it much easier for Honda to equip the VFR with cruise control straight from the factory. Maybe 2018? The DCT version ($15,999) of the VFR1200X is about 23 pounds heavier than the manual transmission version ($15,599). Honda claims a ready to ride weight of 631 pounds. That’s pretty heavy and that weight is way more of a factor in the dirt than out on the street. With a bike this heavy, riding in the dirt is a very calculated and mellow experience. The last thing you want is the VFR getting out of shape or coming into a dirt corner too hot. Most of my riding is on dirt bikes and adventure bikes mainly on dirt so the VFR suspension felt comfortable on the street. In the dirt the VFR suspension is way too soft to be anything near aggressive. Again, this is a street-minded machine with some ability to navigate smooth and mellow dirt. If and when you head down any dirt road, do it with a light right hand and an eye for objects that could collide with the undercarriage. Our VFR for this test had heated grips and they were a nice touch. We didn’t ride through any rain or snow, but the temps did drop and having warm hands tricked my brain into thinking I was warmer than I was. I had the temp set on high with fairly thin gloves and never felt the grips to be overly hot, so they might be a little weak if you are riding in very cold conditions with thick gloves. At the end of the day, the 2017 Honda VFR 1200X is an extremely friendly and easy to ride adventure-touring bike. The engine is incredibly powerful and the DCT transmission is downright awesome. Add cruise control and this thing is ready to pound a lot of pavement and lightly dance on dirt roads. Visit powersports.honda.com for more information.